Sleepless in Sheffield… – All things JenkinSunts! …or The Walking Dead or any other pun you can think of which conveys that I am knackered. 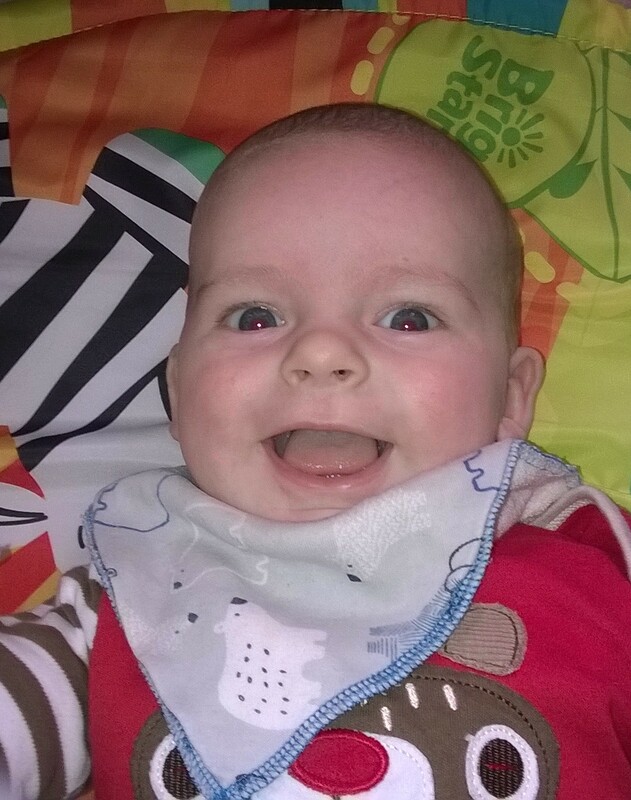 The reason: we have well and truly crashed into the 4 month sleep regression and wonder week 19 – yaaaay! Our experience is pretty much the same as this lady, only I’m on the first time mum path and instead of going to the doctors, I stocked up on baby calpol, ibuprofen, olbas oil and nasal spray as A was really bunged up and we haven’t let A cry it out – I’m a softie. I’m not certain but I think it’s been a couple of weeks now since the sleep deprivation started; we had a very very grumpy and unsettled Monday which eventually resulted in me stuck at home under a sleeping A, this then derailed my plans for Tuesday as I thought he was poorly so I didn’t want to go to a baby group and spread germs to other babies. But, despite being really snuffly at night time and waking up more, A was absolutely fine on Tuesday so we went to a new (to us) group on Wednesday morning which was really nice. We walked there as it was a nice day and A slept for 30 minutes in his pram and on Thursday he also nodded off when we went to Costa but my earlier comment about developing a routine was definitely premature and I have had no luck in getting A to nap at home unless it’s on me or in the sling but that’s another story! Things notched up a gear last weekend when A started to wake up every 2 to 3 hours and when he also decided that 5.15am was wide awake time and that’s continued for the last week or so really, with wake ups every 1.5 hours last night – yaaaaaaawn. It wasn’t too bad for the first couple of days but now that it’s been over a week I am definitely missing 4 hours of consecutive sleep! It definitely feels like the hardest week I’ve had so far. Although it was very very very lovely to have family visiting on Sunday to Tuesday, I’m not sure I was much of a host in the evenings as I had to really fight to keep myself awake when I started the bedtime feed and found myself lying down on my bed in a dimly lit room. It was also a tough week as Mr.J had squash in the evening on Tuesday and he was lucky enough to go to Anfield to see Liverpool beat Sunderland on Wednesday so I was on daytime and evening duty those days. Plus, unlike the very early days when we were both awake lots in the night but managed to get some rest during one of the longer sleeps in the day, it’s now the opposite of that. The only thing which seems to help settle A when he is just upset for no ‘real’ reason is to carry, bounce, jiggle and sway with him. This is where slings have saved the day, but a 7.5kg baby who is screeeeeeching in your ear still starts to physically and mentally tire you out after a while, as I’m sure the lucky people who were in Pizza Express with us on Wednesday lunch will attest to! I also feel bad for Mr.J as he’s been very busy at work and having to manage on minimal sleep as well. But, like the other lady says- it’s all absolutely worth it and I know (hope!) the disrupted sleep and grumpy days wont last forever. I can already see lots of new stuff happening with A too. My favourite is when he sits up on the sofa and then slowly tips forward or sideways until he ends up on his tummy. I’m not sure why it amuses me so much but it does! And, it leads to some very strong head lifting and lots of leg kicking and grunting and it’s easy to see how it will soon turn into a roll – eeeeek! I can also end this post on a high note as I had a lovely evening out last night eating delicious Indian food and chatting with friends and I’ve had the loveliest day today for Mother’s Day! Mr.J made me american pancakes for breakfast, did the hoovering and washing, made an awesome roast dinner AND I got two lovely cards, some yummy chocolates and a wonderful photo book. But, the best thing was the A was very happy for lots and lots of the day today and I got lots and lots of smiles and giggles. Love reading your posts! Glad you had a good Mothers Day, if a little sleep deprived. That 4 month sleep regression is a killer. We had it with all 3 boys, like clockwork. With Elliot, the most recent addition, he fed/cuddled every 40 minutes. Yes, 40 minutes. I was a wreck by the end and all of us were shattered. It lasted for a good 3 weeks then suddenly stopped. It does pass, really it does. Elli is now 15 months old and we are just biding our time until the big 18 month sleep regression. Again, I am not convinced that he won’t have it seeing as we’ve endured it with Ben and Adam already. What I found hard with the 4 month one, especially first time round, is that everyone quickly assumed that weaning needed to start. I’m glad to this day that I waited it out, that I chose to baby led wean, that by the third child I recognise that a sleep regression isn’t about food but more about development. It always precludes a big step – the 18 month one is usually language or walking, the 4 month rolling over. Hope it settles soon. As for sleep, do what you need to. If he needs rocking, sling, it doesn’t matter, he won’t be doing that forever. If you really want him in his cot, then it might take a little work but it’s your choice. I always put mine down awake but drowsy in the cot, but then if they don’t sleep at home then I can’t do all the other crap that needs doing, from housework to 6 year old homework. The joys of solo parenting 3 boys whilst Matt is in Edinburgh all week! I honestly don’t know how you do it Keri. I cannot begin to imagine how I’d have been able to look after one, let alone two, children this last week. Never mind Wonder Weeks – I think you’re Wonder Woman!!! Lol! It gets easier. Parenting courses along the way have helped – Sheffield has a few that are really good, especially from 18 months upwards.